No estate version for new Chrysler 300C | What Car? Chrysler's new boss has ruled out an estate version of the latest 300C. The new version of the 300C which has been developed in an unusually rapid 18 months at a cost of around 650m will arrive in UK showrooms next March. The UK version will be branded as a Chrysler, but the car will then go on sale across the rest of Europe as the relaunched Lancia Thema. 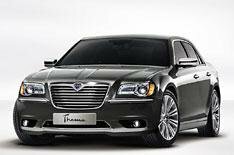 The 300C will be launched in the UK with a choice of two V6 diesel engines, with 188bhp and 236bhp. These will be equipped with a five-speed automatic transmission but Chrysler's version of the ZF eight-speed automatic (a gearbox also used by Jaguar) will be available with diesel cars soon after. Mr Chehab also said that a four-wheel-drive version of the 300C is 'ready to go now' - but Chrysler UK sources say that no decision has been taken on whether to offer the car to British buyers. Chrysler is pitching the 300C as 'Audi A8 size for Audi A6 money'. No prices have been confirmed for the UK, but sources say it's likely to start at just over 35,000.